Throughout your career, you will undoubtedly have numerous bosses. Some will be good, some will be bad. Very few will be outstanding, and hopefully, very few will be outstandingly bad. I will discuss the characteristics that you should look for in a good boss, and those to look out for in a bad boss. Early in my career at Bell Labs, lo those many years ago, I had the tremendous privilege of having the best boss I’ve ever had, John Sheehan. John was a strong manager with an outlook that has stuck with me throughout my life. His governing philosophy was, “Say what you mean, mean what you say, and do what you say you’ll do!” See the link for more. I’ve tried to emulate his approach throughout my career, generally to very positive effect. Shortly after working for John, I had the misfortune of working for the worst boss I’ve ever had, who I won’t name. This boss was a petty tyrant, mean, spiteful, vindictive, credit stealing (see Stolen Credit - It’s Not Just About Credit Cards! ), and overall a terrible boss. I’m actually grateful for having had the experience (despite the living hell of working through it). It demonstrated so forcefully what I would strive to never become, particularly after working for John, who showed so positively what I absolutely wanted to become. This bad boss set a negative example so bad, that all my other bosses, and many other assorted managers I’ve known, all showed much better characteristics than this one bad boss ever did (see Learn from Good Role Models; Learn More From Bad!). Overall, the learning experience of working with such a variety of bosses and boss types has been truly educating, helping to learn what works, what doesn’t, what to emulate and expand on, what to reject and avoid, and how to be as effective as possible in doing your own work and in helping to successfully direct the efforts of others. What follows are some thoughts on the characteristics of good bosses and what they can do to improve the lives of their employees, and what bad bosses can look like and how they undermine the work of their employees (see Mis-Managers: How Bad Managers Can Poison the Well). A good boss shows leadership by example, and helps his/her employees learn about leadership, whether that is leadership of a subgroup, of a project, of a specific effort, showing leadership in meetings, or any of a wide variety of other leadership approaches (see Leadership Is Not Just for “Leaders”, and Lead, Follow, or Get Out of the Way). A bad boss tends to ignore his/her employees, except when they’re really needed, and generally provides little in the way of useful guidance or true leadership. He/she also tends to use his/her employees as pawns to blame for problems for which the bad boss is actually responsible. A good boss gives his/her employees clear expectations on what they’re expected to do, and on how they can best accomplish it. He/she doesn’t do the job for them, doesn’t spoon feed them every step of the way, and doesn’t think for them. He/she just lets them know what is expected of them, and how they can best accomplish what is expected. If employees come back with questions or concerns, a good boss answers and guides them, again, without doing the work for them (see Hire Adults, Expect Results!). A bad boss typically gives vague descriptions of the job and avoids getting further involved, often discouraging further interaction. This makes it easier for a bad boss to place blame (see Unrealistic Expectations). A good boss provides his/her employees with meaningful objectives, with goals and targets to shoot for that capture the importance and value of the work they are about to pursue, and that make their work understandable. Such goals and targets should be concrete, achievable, and actually fun to shoot for. They should tie together the context of the work of multiple people, bringing out competitiveness in a positive, enjoyable, and professional fashion, rather than in a dreary, repetitive, breaking rocks, just doing work for work’s sake kind of way (see Promises and Delivery). A bad boss gives his/her employees work assignments, but without specific or meaningful objectives, goals, or targets to achieve. They are assigned work, but without context or meaning, making it difficult for them to succeed, or effectively work together. A good boss provides his/her employees with a true sense of purpose, an understanding of the common goal of their work, and a reason for them to work closely together to achieve that goal in a way that builds a true esprit de corps (see Pigasus, When Pigs Fly!). When a good boss provides such an exciting common sense of purpose, it can make people really look forward to coming to work every day! A bad boss may describe the basic job, but fails to let the employees understand the opportunities that can make the job exciting and enjoyable, or the best ways to approach it. He/she thus turns what could be a truly inspiring opportunity into just another dreary job. A good boss provides his/her employees with high degrees of autonomy and independence. He/she allows his/her employees to make their assignments truly theirs, as most people care more when they’re in charge, empowered, and in control. Such freedom encourages innovation, and finding new ways for them to accomplish what needs to be done in the ways that work best for the individual employees. A bad boss micromanages and oversees every detail, giving their employees little freedom to do the job their way or to show their unique flair and ingenuity. A good boss knows that every employee does some things well, even a relatively poor performer, and that when an employee does something very well, it should receive praise and appreciation. Such praise should be given in public (as well as in private), so that others learn that good work is recognized for others to see. At the same time, when an employee does something wrong or badly, it is necessary for that person to get constructive criticism letting him/her know what was wrong (see Everyone Does NOT Deserve A Trophy!). However, such criticism should be given in private, to avoid public embarrassment, and the stigma that could come with it. A bad boss is stingy with praise, if he/she gives it at all, and very public with criticism, often enjoying making a spectacle out of some real or imagined instance of poor performance (see Embarrassment Rules the World?). This makes working for a bad boss even more deplorable. A good boss is consistent in his/her interactions with all employees, treating every person fairly and consistently. Since every person is different and their assignments are different, the interactions with every person may be different, but the treatment should be consistent and fair. Open and honest communication is key to such consistency, particularly when keeping people informed about decision making and how it affects them. A bad boss is often very inconsistent, treating different employees differently, showing favoritism, telling different employees different things about the same actions, etc. Such inconsistent behavior breeds discontent and contempt for the boss, and is destructive to both the boss and his/her employees (see Floggings Will Continue Until Morale Improves!). 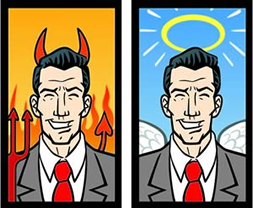 Clearly, there are many other good/bad boss differentiators. For example: encourages/doubts, listens/ignores, trusts/mistrusts, humble/arrogant, communicates/secretive, empathetic/self-centered, even tempered/bad tempered, decisive/indecisive, sense-of-humor/bad-humor, etc. I invite you to send me more examples. Regardless of the specifics, a good boss can make your work life an enjoyable experience that you look forward to every day, and a bad boss can make your work life a living hell that you dread going to. If you’ve got a bad boss, do what you can to change that, either by finding ways to change your bad boss into a good boss, or by getting moved to a good boss. This information may help you learn better what to look for. Life is too short to spend most of your time working for a bad boss!